EGM Director Jim Hanon is participating in the “Living Conflicts in India, Pakistan and Palestine: Religion, Secularism and the Search for Peace” symposium held this year at Arizona State University. The politicization of religion in the regions of India, Pakistan and Palestine provides a deep lens through which to examine the implications and influence of secularism and to explore whether new articulations of religious tolerance and religious diversity are also emerging. In the this film festival and symposium, titled “Living Conflicts,” the issue of the growing disenchantment with secularism as a path to peace on the ground in India, Pakistan, and Israel/Palestine will be discussed. Alongside the screenings, there will also be a symposium to discuss with filmmakers, historians, and film studies scholars the importance of the visual medium in forming public opinion — and as a critical space of public debate and the assertion of religious and secular ideals. Do people respond and react to what they see and act out their violence? Are the images we see on film representing reality? Should filmmakers play a role in reorienting the public away from violent religious nationalism and towards secularism as a politically and culturally acceptable public project? What part can film and other forms of media play in expressing these tensions or providing a vision of what is possible? This documentary film festival and symposium will provide an opportunity to engage with and reflect upon life and the struggles of people living in conflict zones and the art of representation for deepening awareness of the contestation between secular and religious forms as pathways to peace in the 21st century. Want to take part in the festival? 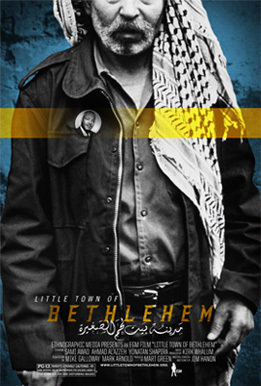 There will be a screening of the award-winning documentary Little Town of Bethlehem held in the West Hall Room, 135 on the Tempe campus. Jim Hanon will introduce the film and will also participate in a Q&A session following the screening. You can also sign up for a screening of Little Town of Bethlehem for your school, church, or other organization by clicking here.